In dog bite cases in Washington State, negligence and provocation by the child can be very important factors to consider. Washington State law states that a child can be held negligent and therefore wholly or partially responsible for that child’s injuries and damages. Thus, the dog owner may be permitted to argue that the child was comparatively negligent for causing the injury. But in Washington there are certain limitations when it comes to accidents and injuries involving negligent children. First, the law in Washington is that children under the age of 6 years old cannot be held negligent as a matter of law. The Washington State Supreme Court has decided that a child under 6 does not have the mental capacity to be negligent. This means that any time a child under age 6 has been injured by a dog, the dog owner’s is not permitted to argue that the child was at fault. Although the issue has not been considered by Washington courts, one could also convincingly argue that a child under 6 does not have the mental capacity to intentionally “provoke” a dog. Thus, the provocation defense available to the dog owner under the “Dog Bite Statute” may not be available in the case where the victim was a child under the age of 6. Children age 6 and older can be held negligent, but only for failing to exercise the ordinary care that a “reasonably careful child of the same age, intelligence, maturity, training, and experience” would exercise under the same or similar circumstances. Thus, a dog owner may be able to argue that an older child was wholly or partially responsible for the child’s injuries, or that the child provoked the dog and recovery should therefore be denied under the “Dog Bite Statute.” Whether such an argument against the child is successful will depend heavily upon the particular facts of the case. 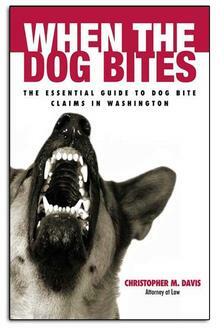 This is a short excerpt from the book “When the Dog Bites: the Essential Guide to Dog Bite Claims in Washington” written by Seattle dog bite attorney Chris Davis. If you want to continue reading, click here to order a free book. Attorney Chris Davis at Davis Law Group, P.S., has nearly 20 years of experience in dog bite cases. He is widely recognized as "the premier dog bite lawyer" in Washington State. Washington Super Lawyer Magazine featured Mr. Davis in their June 2010 Issue. Call for a free consultation and Mr. Davis will answer any further questions you may have, (206) 727-4000.